The Hot House is the sixth level in Pikmin 2's Challenge Mode. The initial number of Pikmin, three, is small, but more can be gained in the first sublevel by using the Queen Candypop Buds present there, in preparation for the threats of the second. 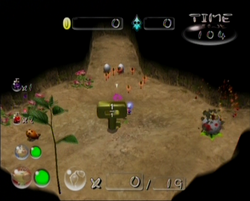 The first thing to do is increase the number of Pikmin available using the Queen Candypop Buds; afterwards, proceed to deal with the enemies that are present on the sublevel. Do not forget about the Key; it is needed to proceed to the next sublevel. This page was last edited on March 17, 2017, at 19:46.